".. A fascinating and important book"
adolescents on how to best FIGHT against drugs, STD’s and so much more! 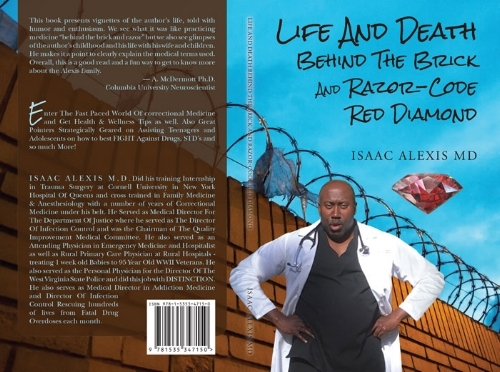 Dr. Isaac Alexis' newly-released book Life and Death Behind the Brick and Razor: Code Red Diamond tells of his varied experiences as a physician in correctional medical facilities while at the same time urges teenagers to make better decisions to avoid the perils of incarceration. Dr. Isaac Alexis brings the fast-paced, high-pressure reality of correctional medicine to readers in his new book. He discusses health problems that inmates face during incarceration and offers detailed descriptions of medical complications that plague many people inside and outside of prison. He also speaks directly to young people about avoiding gangs and drug addiction, as well as respecting their bodies in order to preserve their physical and mental health and their freedom. Dr. Alexis's personal experiences growing up in a tough New York neighborhood act as examples of how young people can overcome obstacles and achieve their goals. The desire to help people who do not have access to quality health care drove Dr. Isaac Alexis to focus on correctional medicine. The author also shares how his faith empowers him to advocate for the best medical treatment for the population he works with. A fascinating and important book, Life and Death Behind the Brick and Razor: Code Red Diamond is a book that should be read by anyone dealing with teenagers and young adults whether in the home, public or educational facilities. "This book presents vignettes of the author’s life, told with humor and enthusiasm. We see what it was like practicing medicine “behind the brick and razor” but we also see glimpses of the author’s childhood and his life with his wife and children. He makes it a point to clearly explain the medical terms used. Overall, this is a good read and a fun way to get to know more about the Alexis family." "Life And Death Behind The Brick And Razor-Code Red Diamond by Isaac Alexis is a hard book to describe. It's part auto-biography and part medical advice book.Dr. Alexis tells us about how he became a doctor and shares some of his stories from working as a doctor in a correctional hospital. He also give a lot of medical advice and addresses issues such as STDs, drug abuse, strokes, parenting tips, leading a healthier lifestyle and much more. I enjoyed hearing about Dr. Alexis's adventures growing up in New York, he gives his reasons for wanting to become a doctor and talks about how seeing people in his family struggle with sickness, his strict mother and wanting to stay away from street gangs made him decided that he wanted to help people. Parts of this book are inspiring as he shows that if you are willing to work hard you can accomplish what you want. Dr. Alexis also gives some great advice throughout the book, such as what your target heart rate and pulse should be and he gets into what foods are the most healthy. He states that a plant-based diet is important and mentions the health benefits of the Indian spice, turmeric. There is a lot of good information along with some gut wrenching stories. Such as a man who needed surgery for a bowel problem and the head of the department would not ok it. There were also stories about people trying to escape prison by doing such things as swallowing razor blades. Probably the best parts of this book is when he explains how easy it is to get STD's, how to avoid them and how you can keep your kids from giving in to peer pressure. Dr. Alexis's book has some great stories and his passion for people really shines through. Though some of the information he talked about went over my head, I still found it informative. I thought it felt a little more like reading someone's blog than a book because the way he jumps from talking about his life, to working in the hospital, to giving medical advice. This didn't take away from the fact that it's an enjoyable educational book and a quick read. It made me wish I had a doctor like him." "I chose to read this book after receiving a free copy. All opinions in this review are my own and completely unbiased. I’m not sure what I expected when I agreed to read this book but I wasn’t expecting what I got. Life and Death Behind the Brick and Razor: Code Red Diamond is different but I like different. It’s not only an autobiography but a look at many of the issues of today as well as a guide to living a healthier and more productive life. Dr. Alexis’s stories are entertaining but more importantly, many of them are educational. It also gives the reader a view of some of the sad and crazy things that go on in prisons. This would be a good book for anyone to read but a great book for young people who could be at risk." Life and Death Behind the Brick and Razor: Code Red Diamond tells a story few of us hear. Realistically, I think most of us expect incarceration to be difficult from an emotional and psychological standpoint. However; the physical health of inmates and the challenges inmates (and correctional facility healthcare staff) face are seldom considered. This book sheds light on some of the more common health problems noted in the correctional facility population--and on the problems faced in caring for that population. 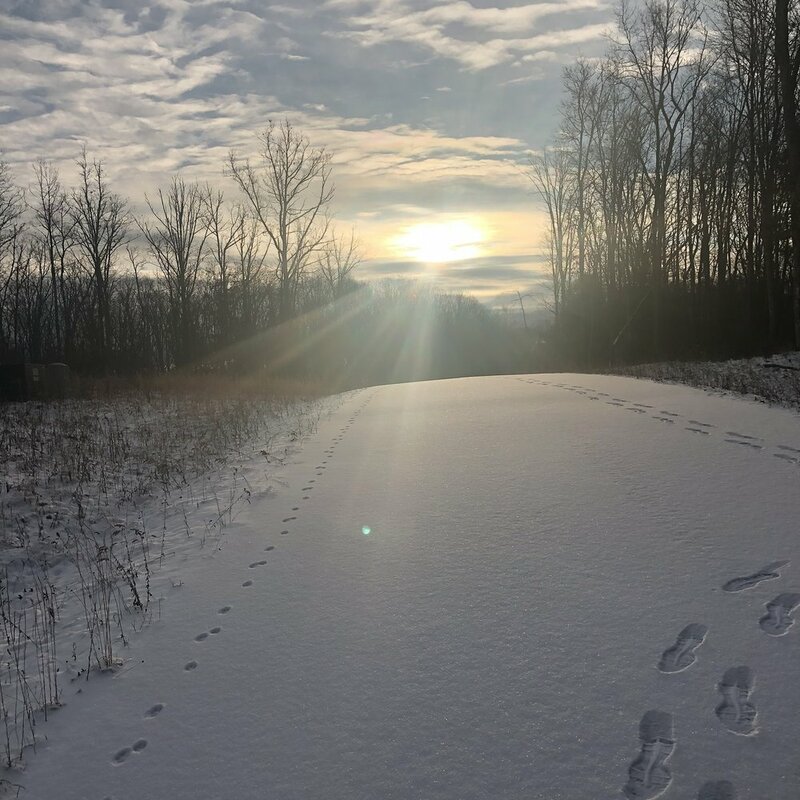 By discussing aspects of health and wellness in life both before and after an individual is incarcerated--Dr. Alexis offers advice and a wake up call that most of us may not have considered. Life and Death Behind the Brick and Razor: Code Red Diamond is brief, yet packed with information. The author shares a lot of medical facts and gives readers a lot of information about the diseases and ailments faced. He dots case studies of real inmates that he has treated along with a lot of personal, family details as well. Although the book is a short, quick read--it should have a lasting impact on its readers. Would I Recommend Life and Death Behind the Brick and Razor: Code Red Diamond. The author writes this book partly for the community to use as a deterrent to incarceration. The author presents valid points from years of experiences--both in the correctional medicine field and from life in New York City--and seems very sincere in his beliefs and presentation. Part memoir and autobiography (to show readers what he accomplished with a strict upbringing and a goal driven mindset) and part public service announcement (as he discusses the risks and impacts of both hereditary diseases and those caused by lifestyle choices in a prison environment); the book is written rather uniquely. The author's writing style changed rather sharply from a life story-telling mode toward the book's end and his messages to readers become very abrupt and more forceful. If you are looking for a book that can serve as a motivational/self help tool for use with at-risk populations--this book is written from a perspective that has not often been presented. Although Dr. Isaac Alexis adds humor and personal experiences in his writing, this "quick read" Book is not eant to entertain, but to educate. The medical terms and technology can be difficult for many of us "layman". However, the benefits from reading this book, outweighs the difficulty. Primarily a Correctional facilities doctor, his keen knowledge is soon realized. He describes many serious heath issues - many can be easily treated or avoided - such as, heart problems, Sexual diseases, conditions affecting the brain, drug addiction and more....Yes drug addiction is termed along with other diseases. I , and for generations, several family members have been cursed with upper colon ulcers. It took several doctor's visits and specialists to discover I had this condition. Once they discovered it, they couldn't find a treatment that would help with it. In just a couple of pages in this book, I discovered it is genetic, what causes it, how it increases in severity, and what one can do to alleviate it. The only help I have received is from an elderly lady working at a Health Food store. I was astounded with his knowledge & understanding , considering the many different types of doctors I have approached in many years, with no explanation of why I have them and with no help! He instills the urgency of getting help for ailments and not allowing it to go untreated. He gives helpful advise to parents on how to decrease the chance of their children getting on drugs or being infected with several communicable diseases. There is a lot of repetition and his writing skills lack a "smooth Flow" but his message is of far greater importance. Isaac Alexis, MD, completed an internship in trauma surgery at Cornell University at New York Hospital of Queens. Dr. Alexis served as medical director at the Department of Justice as well as director of infection control and chair of the quality improvement medical committee. He has several years of correctional medicine under his belt. 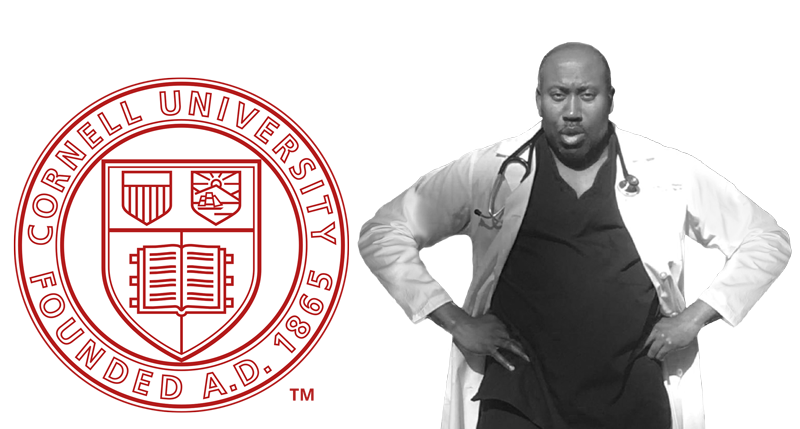 Dr. Alexis's book Life and Death behind the Brick and Razor-Code Red Diamond relays his experiences as a physician in correctional medical facilities while also challenging teenagers to make better decisions to avoid the perils of incarceration. He also served as an Attending Physician in Emergency Medicine and Hospitalist as well as Rural Primary Care Physician at Rural Hospitals - treating 1 week old Babies to 95 Year Old WWII Veterans. Also served as the Personal Physician for the Director Of The West Virginia State Police and did this job with DISTINCTION. He also serves as Medical Director in Addiction Medicine and Director Of Infection Control Rescuing hundreds of lives from Fatal Drug Overdoses each month. If you are in need of a particular service that is not listed below, please contact me directly and we may be able to create a custom solution for your needs. Have low energy? or want to lose weight? Or have other health issues? Dr Isaac Alexis will help you with effective ways to get improvement. I will work with you one-on-one to detail effective ways to improve energy and lose weight and will walk with you for one hour. For details regarding specifics of whats included and how this can help you, please contact me. Looking for a speaker for an upcoming event? Dr. Isaac Alexis M.D. can help. 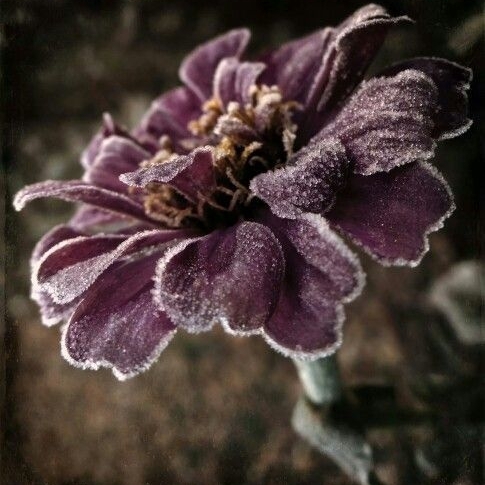 A collection of our latest media from around the web. Please check back as this section will be updated. The Gateway To Health by Way Of PREBIOTICS. Questions? Or feedback? Please get in touch.